Tag Archive | "Audrey Brownell"
Donald White, age 95, of Cedar Springs, passed from this life on Monday, January 25, 2016. 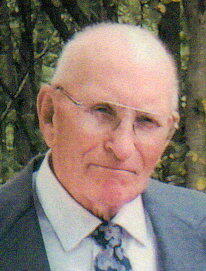 Don was born in Montcalm County, Michigan on August 9, 1920 to Vern and Hazel (Rogers) White. At a young age Don and his family moved to Ensley Center where Don was raised. On September 19, 1941 Don married the girl of his dreams, Audrey Brownell. The couple resided on a farm in Courtland Township for 71 years until Audrey passed on February 2, 2013. Don White was a horse man. There was a sign in front of their home that said, “Horses for sale, by Don White.” Don farmed his land almost to entirety with horses, only using a tractor to run the belts of the thrashing machine. Don traveled the state with his wagon and team of horses, appearing in various parades, but most notably the Red Flannel Parade in Cedar Springs. For many years Don and Audrey were members of the Draft Horse Club that met in Blanchard, Michigan. Don was preceded in death by his parents; his loving wife; his granddaughter, Kelly Jean Brophy; seven brothers, Ben, Wayne, Roy, Alton, Floyd, Alvin and Bernard White; four sisters, Mildred Barnes, Frances Johnson, Pauline Rebecca White and Virginia Reed. He is survived by his three children, Suzanne (Jennings) Johnson, Bonnie (Tom) Reynolds and Donald White, Jr. and special friend, Judy Sailor; his grandchildren, Scott (Michele) Johnson, Brian (Julie) Johnson, Mark (Veronica) Allen, Julie Anne Johnson, Jason Van’thof, Molly Goodman, Jordan White, Rebecca Reynolds and Thomas Louis (Audrey) Reynolds Jr.; 26 great-grandchildren; 10 great-great-grandchildren. Don is also survived by his brother, Robert White; his sisters-in-law, Stella White, Hattie White, Yvonne White, Esther White, and Yvonne Brownell Hendrick and many nieces and nephews. The family greeted friends Wednesday January 27 at the Bliss-Witters & Pike Funeral Home, Cedar Springs. The Service of Praise and Thanksgiving for the gift of eternal life through Jesus Christ will be held Thursday 11:00 am at The Springs Church, 135 N. Grant St., Cedar Springs. Pastor Wayne Cash and Donald’s son-in-law, Pastor Jennings Johnson officiating. Interment Solon Township Cemetery. Memorial contributions may be made to The Springs Church.